Hello, hello, hello! Welcome to the Mama Elephant Design Team Stampede! I know you've been checking out the sneaks all week, are you excited? The full release was revealed yesterday and they are already live on the Mama Elephant site}. Today, the DT is just sharing some fun projects from each set:) My stampede projects uses the fun new alpha set, Sketchy Letters! I love the handwritten feel of these letters. They are very forgiving when you line them up:) For my card, I really wanted to highlight the letters, so I went one layer, super CAS. I painted watercolor blobs (lol) across the card base as a colorful background. I love how the letters look against the soft colors! Here's a closer look at the detail of the stamps! Love it! That's it from me! I told you it was super CAS;) Now before you finish stampeding, don't forget the giveaway! LOVE this card and the alphabet. It is the font on my blog! You can't go wrong with sketchy letters and blobs of color! The letters really stand out with the colors! Great card and stamp set! Thank you for sharing! water color effect is very nice. and I think I might need that alphabet. love the sketch look! Great card! Love the water color effect. Love the sketch look of those letters! Wow. Beautiful card. I am a HUGE fan of clean & simple designs. Love Mama Elephant. Their stamps are GREAT!! So simple but awesome. I like that alphabet stamp set. Super cute JJ! I love the alpha set! You had me at sketchy letters but when you said they are also easy to line up, they have to be mine for sure! I just love using alpha sets to personalize cards and make up my own sentiment ... 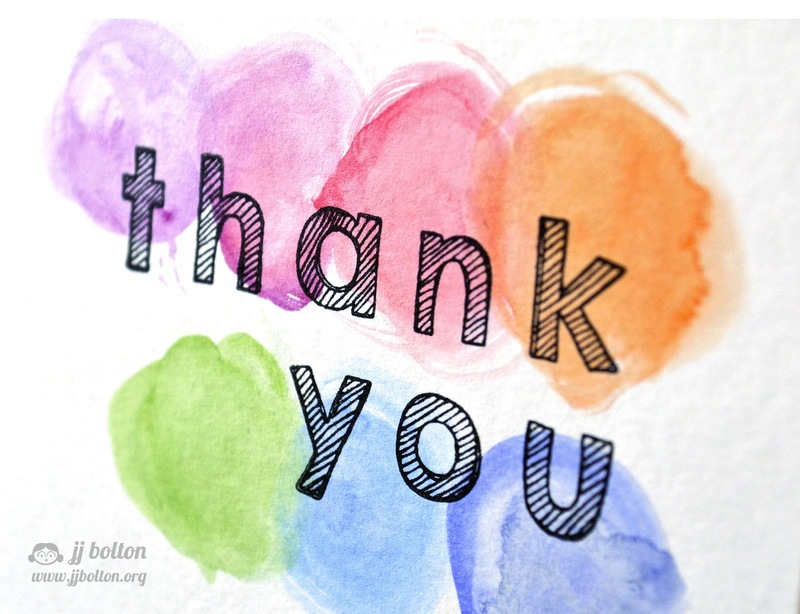 Thanks for the gorgeous inspiration - those watercoloured circles are the perfect backdrop to your card's message. Those letters are awesome and I love, love the CAS card. Beautiful! I love this alpha set. They make a nice bold sentiment. I really love the size of these letters and the fun sketchy style is so different from other alphas that I own, your card is so clean and fresh with those pops of color highlighting your sentiment! Ohhh my style big time. I love those letters, possibly the nicest alphabet set I've seen in ages! Love that stamp set and the sentiment looks great against your color blobs. LOVE this sketchy letters set! Such a cool font! This is a beautiful way to make a CAS yet colorful card - terrific! What a sweet card. So simple but adorable. My style for sure. I just LOVE that alphabet set! I follow Mama elephant on Face book and Twitter. Linda Vra on face book and #TOnlyalady on twitter. I am so loving all the stamp sets alot. Seriously??? I LOVE THIS. Simple and Sweet! What's not to like? 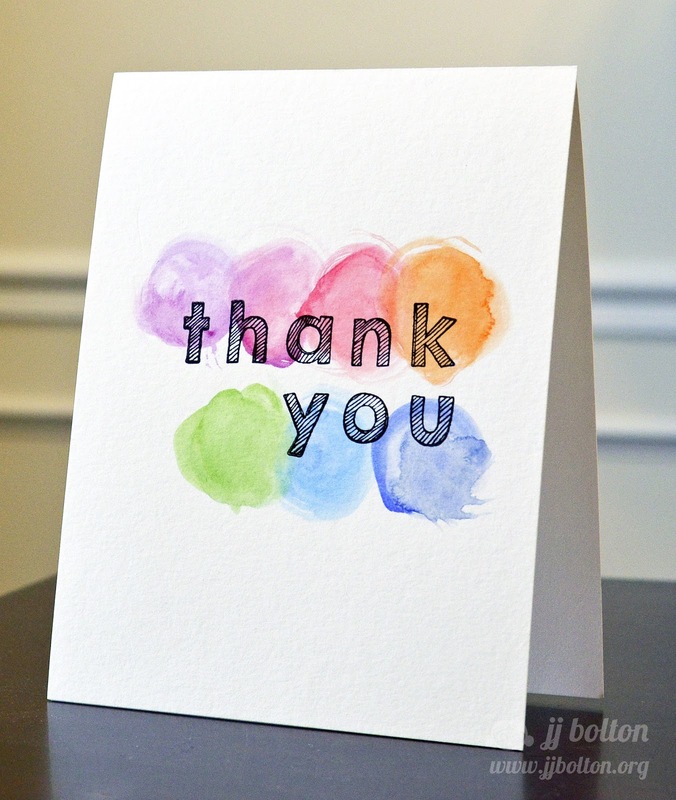 Love this card -- especially the water color spots! Thanks! Those sketchy letters go perfectly with the blobs! Love this!!! I like ME on FB and shared there. You made something so simple look so great! Awesome card, JJ! What a great way to highlight the letters and really make them pop! This alphabet is very nice and cool. I love the colors you used to highlight your alph-sentiment. How creative and how fun! 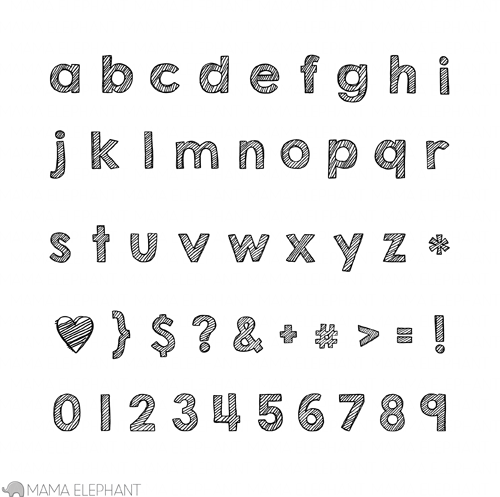 Your watercolour blobs are a perfect match for these fun doodled letters. I think your "watercolor blobs" are really fabulous, JJ (LOL), and your alphas are just perfect! Really fun card...thank you for always inspiring us!!! Thanks for sharing! Lovely cards! I like these letters because they're only a 1/2 in. high - i.e. small enough to use for a card! Watercolor blobs!!!!! Too cute :) LOVE the sketchy letters!!! I love these letter stamps! So cool! I love the hand drawn feel to the lettering. Easy shortcut to cute. Watercoloring looks great. Those sketchy letters look fantastic over top of your soft watercoloring!! Love it! Your cards have been so awesome all week long! Thanks for the inspiration. Arty, colourful and fun, I love it! Love the watercolor looks you've been rocking lately! Thanks for sharing! Colourful, fresh, oh so pretty! Fabulous showcase of the new release! This is so pretty!! Love the watercoloring!! Such a neat card. Love the watercolor idea. Love this card and love those sketchy letters! Great CAS card. Love those watercolor 'blobs'! what a fun card - love the look! I love the water blobs!! LOL!! Fantastic colors. What a great alphabet set. I'm glad that you said they were forgiving when lining up...I'm horrible at lining up letters. LOL. Like the watercolor with the fun letters. Love, love, love! This set is on my wish list for sure. Wow, love how you made the letters transparent so the color shines through! Love this fun watercolor look with the alphabet stamps! What lovely blobs they are! Really simple yet, stunning! Cute card. I really like the sketched letters. Thanks for sharing. More evidence that I need this set in my life! lovely card!!! Love your happy colors! This is a great alpha set. Such a nice contrast of your watercolor blobs and the black sketchy letters. Super CAS, but totally fabulous!! Great CAS design. I really like these fun new fonts. Love that watercolor background; gorgeous! Love this card! It is so simple but truly stunning! Cute watercolor blobs of color! They really make the sentiment pop. Thanks for sharing. Just love these sketchy letters, such fun for an alphabet set! dude! how can you even make watercolor 'blobs' look incredible?!!? you're amazing! you know what it would look like if i tried blobs...a mess! lol!! i LOVE the look of the sketchy letters over your colors! it is so modern and graphic and artsy! awesome!wow! Oh, this watercoloring if fabulous!! TFS! Pretty!!! Love the yummy colors and the watercolor!! So clean and simple. I love watercolor effects. JJ...this is simplicity at its finest. Love your card and how the sentiment pops against the watercolour circles. Thanks for sharing. Great use of color - and I love the alpha stamps. Thanks for sharing. I liked ME on FB. Thanks for the chance! I really like this letters, especially how you can see thru them. Great card. Thanks. Love the clean and simple card :) Great colours. I love your card - simple yet perfect! The sketchy letters are cool. What a perfect CAS card! I love it! I just started following ME on twitter! Wonderful way to showcase the new letters! Love the colors! You did a FABULOUS job with this CAS card! Really love the font stamp set!! Simply beautiful background. Lovely card. Super simple, super CAS = total love! Simple yet elegant I love the colors you used and the alphabet is awesome great card have a wonderful day! You always get me with your great use of color. Wonderful alphabet that you highlighted beautifully here JJ! I love the look of the sketchy letters on the water colored blobs. lol Such a lovely, CAS card. Lovely cas card! Those sketchy letters pop so beautifully over the watercolor blobs. wonderful and colourful card...love the watercolour effect. Great background for these letters. Love the fun scribble letters and the watercolouring! Love it, simple and fun!! Love those little sketchy letters! Love this CAS card! Great idea to have the watercolor blobs peek through the sketchy letters! I cannot tell you how beautiful this is! wow! The post featuring your project will credit you & link back to your blog as well. If you do not wish to be featured, just let me know.